Even as the cranes of development encroach upon Burwood Road, the clogged vein that runs between the Hume and Parramatta arteries, it’s still possible to find hints of the past. 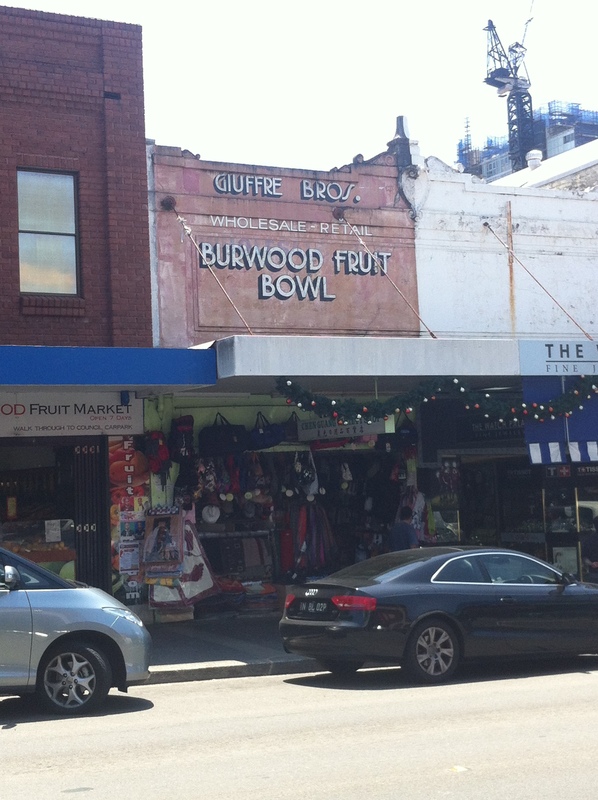 For example, here we have the Burwood Fruit Bowl, run by the Giuffre brothers. According to the can’t-believe-it-exists Sydney’s Italian Fruit Shops dot com, a Carlo Giuffre managed a fruit shop on Burwood Road from 1910-1916 before leaving the country in 1918. Repeat: that was his reaction in 1918! Imagine if he saw Burwood Road now! Sands directories from 1908-1912 mention a Giuffre Bros fruiterer in the Newtown area, but no word on whether they employed their clever-once shop name a second time. Whether his brother stuck around and kept the shop going is also unknown, but it certainly requires a hefty suspension of disbelief to imagine this was the 1916 shopfront. The font used in today’s vintage shopfront signage to me seems very 20s, and certainly striking enough to keep around…at least until the bulldozers get to work. Until that time, the Chen Guang Variety Shop provides Burwegians (c’mon, give me that one) with all the junk they’ll ever need, while the neighbouring Burwood Fruit Market fills the street’s Giuffre-shaped void with fruit as blandly efficient as the shop’s name. 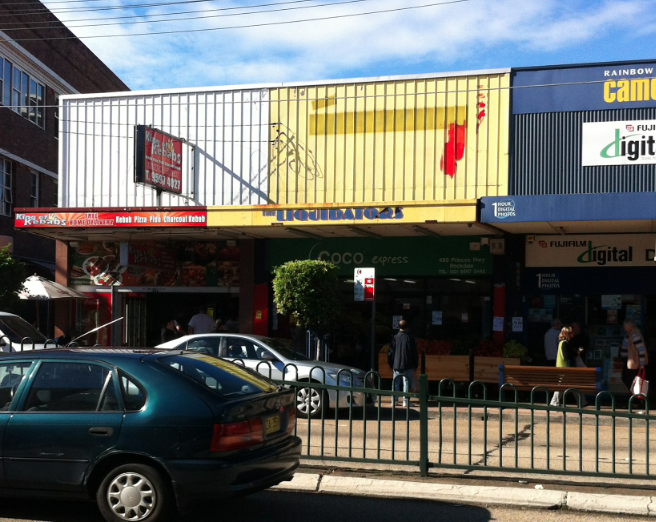 By remaining nameless, this relatively new Rockdale fruit market is presumably hoping to avoid the fates of its predecessors. First we have Coco Express, a women’s fashion outlet with a meaningless name. Seriously, does Coco Express evoke any thoughts of women’s clothing whatsoever? And if it does, what kind? Coconut bras and hula skirts? Going back even further we can see this was once the domain of the Liquidators discount variety store, a Reject Shop reject. They’re all gone now so it’s safe to talk about them, and I’d like to say that for a business called the Liquidators, they left themselves open to a lot of ridicule by not completely covering their tracks and liquidating. I like that they got a ladder happening to paint over the higher instance of their logo, but ran out of liquidation for the awning. Budget indeed.